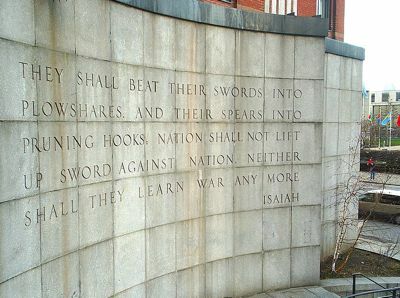 The “Isaiah Wall” near the United Nations in New York City. Photo provided by Wikimedia Commons. “Who is your visionary?” That’s the question we’re asking readers this spring: Can you think of a visionary who has shaped your life’s approach toward peace and justice? Today, we start with the introduction titled “Prophets and Visionaries” from my book Blessed Are the Peacemakers. I am accompanying this thought-provoking chapter with profiles two South African visionaries. (You can find all three pieces linked from our Interfaith Peacemakers home page.) Stay tuned to this website each week in April and May. Every week, I’ll try to get you thinking about a different kind of visionary. Then, in May, I’m going to invite you to join in this process. For diplomats working in New York City, the prophet’s vision echoes the United Nations Charter to “save succeeding generations from the scourge of war.” We all need voices like that of Isaiah, calling us to a better way of living together. Prophets arise within religious traditions, calling people to live in peace and justice according to divine dictates. Prophets also can be secular, speaking from values shared by all humanity or within a particular culture or nation. Prophets speak truth about our world—and call us to our higher standards. History is rich with prophets. No movement for justice or peace was ever launched without someone taking the prophet’s mantle and giving direction to the longings among hurting people. 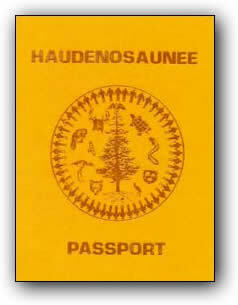 The pine tree remains a central symbol of the Haudenosaunee (or Iroquois) people and is prominent on the passports the tribal government has issued throughout the past century. Before the Europeans came to North America, a Huron prophet named Deganawida challenged warring tribes to come together in peace. He traveled across the eastern Great Lakes region with a vision deeply rooted in the religious traditions of the tribes. His call to peace inspired a weary Mohawk warrior named Hiawatha to put political form to the prophetic vision. Deganawida’s dream took shape in the formation of the Iroquois Confederacy. Five tribes came together to form the confederation: The Senecas, the Mohawks, the Oneidas, the Cayugas, and the Onondagas. Later the Tuscaroras joined and the confederacy was renamed the Six Nations. They buried weapons in a pit and then planted a pine tree on top as a symbol of the life growing out of their peace compact. That peace agreement bound the tribes together for at least two centuries. The Iroquois Confederacy also created a democratic structure for decision-making that was adopted in large part by the young United States government, enabling large societies to make major decisions through peaceful means. “crucified not once, but thousands of times.” Las Casas’ concern as a priest became, not the salvation of the Indians, but the salvation of the Spanish themselves. He saw the Spanish system persecuting Christ in the persons of the poor Indians. Las Casas seemed a lone voice at the time, but his voice still echoes hundreds of years later in lands where poor and indigenous peoples continue to suffer exploitation and the denial of basic human rights. 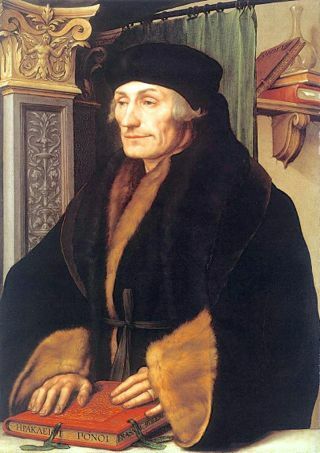 Desiderius Erasmus as painted by Hans Holbein. Erasmus practiced what he preached at great risk in those volatile times. He disagreed with Martin Luther and would engage in rigorous debate, but he refused to condemn the Reformer as a heretic, bringing harsh criticism upon himself from Catholic leaders. Erasmus believed talking through the conflicts and disagreeing was far preferable to going to war. Joanna Macy is a Buddhist scholar and teacher who bridges the worldviews of the East and West. She has facilitated workshops around the world to help people do deep emotional thinking that lays the foundation for peace-building. For Macy, “The most remarkable feature of this historical moment on Earth is not that we are on the way to destroying the world—we’ve actually been on the way for quite a while. It is that we are beginning to wake up, as from a millennia-long sleep, to a whole new relationship with our world, with ourselves and each other.” Macy helps workshop participants explore what a life-sustaining society would be like, something that cannot be done individually but must be a shared project with others. She has been especially powerful in helping people unpack the deep barriers of grief, fear, numbness and despair that prevent our action for peace and sustainability. Prophets can sometimes arise from surprising sources. One person who most pointedly addressed the matrix of relationships forging modern war was Dwight D. Eisenhower. He had been the commander of the Allied forces in Europe in World War II and then President of the U.S. as a global superpower during the Cold War—not positions from which one would expect prophetic words of peace. Yet he spoke about the “grave implications” of a new threat within the U.S.: “In the councils of government, we must guard against the acquisition of unwarranted influence, whether sought or unsought, by the military-industrial complex. The potential for the disastrous rise of misplaced power exists and will persist.” He also critiqued the economic implications of militarism: “Every gun that is made, every warship launched, every rocket fired signifies, in the final sense, a theft from those who hunger and are not fed, those who are cold and are not clothed.” No religious prophet could have spoken as pointedly as this military man. Prophets give shape and direction to our hopes. When Martin Luther King said “I have a dream,” he was articulating the dream millions of people had but could not express so eloquently. The prophet’s words are embraced, repeated, set to melodies, chiseled into stone and passed on from generation to generation. They keep the flame burning bright to light our path toward peace and justice. This chapter is part of Daniel Buttry’s book Blessed Are the Peacemakers. See all of Buttry’s books in our ReadTheSpirit bookstore. And, please, tell friends about www.InterfaithPeacemakers.com. You can do that right now by using the blue-“f” Facebook icons or the envelope-shaped email icons.